The Saffron Housing Trust, in south Norfolk is investing £7 million into a scheme that will install solar panels on the roofs of 1,000 homes! This is all in an attempt to help tenants lower their energy bills, especially as they are continuously increasing in price. Photovoltaic solar panels are to be installed to produce electricity, passing on the benefits to the tenants. Any excess energy will be put back into the grid by Saffron and any money received back through the government’s feed-in-tariff, will be used for investment in homes and services in the future. This is something that would benefit not only the homeowners, but the company can help improve your community too, win-win! Saffron’s Asset Manager explained how they have already tested the use of solar panels on a small number of properties, to get an understanding to whether the project is economically viable. “I am delighted that such a dynamic project is being undertaken by Saffron as it builds on its use of alternative energy sources to benefit all of its tenants,” he added. This news comes as solar is taking off across the country, with towns and cities doing similar schemes. Recently, 7 schools in Yorkshire benefitted from a £1 million scheme to power their heating and hot water through thermal solar panels and Birmingham is having £3.1 million invested into energy efficiency projects. Anglian Home Improvements raising the standards of your home since 1966. 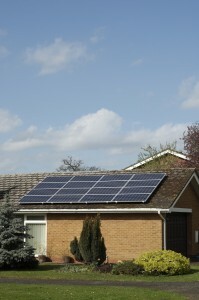 Visit the Anglian website for information on our solar panels.